Say hello to Kenny George. 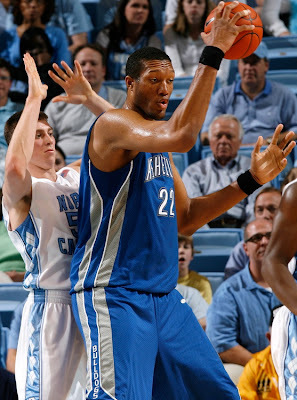 He is a 7-foot, 9-inch center on the UNC-Asheville basketball team. He recently started playing basketball again after a three year hiatus, and he wears size 26 shoes which were used as fishing boats while he took time off from playing hoops. He dunks without leaving the floor, blocks shots with his armpit, and grabs fighter jets out of the air with his bare hands. I think if Gheorghe Muresan and Laurence Fishburne were to procreate, they would spawn Kenny George. He might even be part Wookiee. This guy is a freak show. Just curious, did UNC Asheville have to get a permit from the city before they put up something so tall and stationary? To get a sense of scale, Hansbrough is listed as 6' 9", 235.